In the evening, once everyone is asleep, Teddy’s big brother, Al, flies off to outer space. In this magical place, he is King Alejandro, ruler of his own kingdom. He has a pony waiting for Teddy, who will be known as Prince Teodoro. 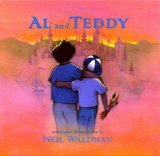 But Teddy is too young to travel with Al, and he must wait until he turns five. Teddy doesn’t realize it, but Al is really traveling through the drawings he creates. Once Teddy discovers Al’s secret, he asks for artwork depicting his very own travels. Although it would be fun to actually fly off to space, Al and Teddy have discovered the ability to travel through their own imaginations, which can take them anywhere they want to go. Al and Teddy is beautifully illustrated, with moon monsters, space ships, and castles. Kids will delight in the ability to travel to any place their imaginations can take them, through the magic of a pencil and paper. All profits from this book will be used to support the young artists of the Fred Dolan Art Academy, a free Dream Yard school.